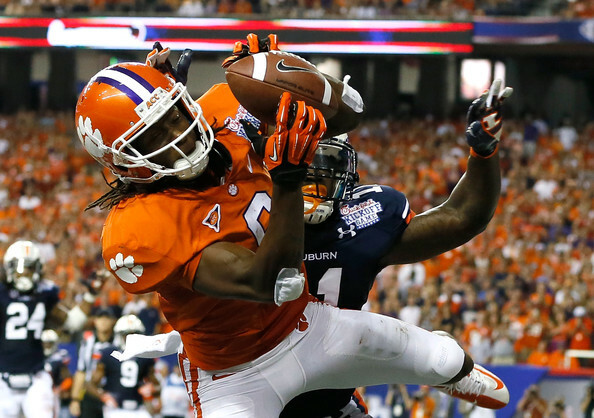 Clemson receiver DeAndre Hopkins announced Thursday he is skipping his senior season opting into the NFL draft. The news comes the day after quarterback Tajh Boyd said he would return. “It is tough to leave because this is my home, this is the place I wanted to play since I came out of the womb,” Hopkins said in a statement. “But, I feel it is best for me and my family to take my talents to the NFL at this time. Hopkins broke Clemson single-season record for receiving yards in 2012, finishing with 82 receptions for 1,405 yards and 18 touchdowns. He broke Sammy Watkins' record of 1,219 receiving yards, set last year. ESPN NFL draft analyst Mel Kiper rates Hopkins the No. 3 junior receiver in the nation. In all, Hopkins established Clemson career records for touchdown receptions (27), 100-yard receiving games (12), and total reception yards (3020). He is second in total receptions with 206 for his 39 career games. He also caught at least one pass in each of his last 36 games to tie Jerry Butler’s record (1975-78).